OKLAHOMA CITY, Okla.—William Shatner, an avid Los Angeles-based reiner who cultivated a career spanning over 50 years as an Emmy and Golden Globe-winning actor, director, producer, screenwriter, recording artist, author and horseman, will receive the National Reining Horse Association Dale Wilkinson Lifetime Achievement Award. In 2007, the NRHA Hall of Fame Committee initiated the NRHA Dale Wilkinson Lifetime Achievement Award, supported by the Reining Horse Foundation (RHF), and each year, the NRHA Board of Directors and past Hall of Fame inductees vote to approve a worthy candidate for recognition. Shatner, one of pop culture’s most recognizable figures, received the award for his contributions as a horseman, horse industry promoter and philanthropist,. This award is named after the legendary reining horse trainer known as the “father of reining,” Dale Wilkinson, the first inductee into the NRHA Hall of Fame. 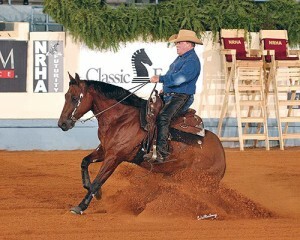 Wilkinson is a multiple NRHA Futurity champion and one of the founding members of NRHA. In addition, during his lifetime, he was an educator, promoter and mentor to all reiners—professional and non pro—exemplifying how a rider should conduct themselves, train and exhibit a horse. Because of his unmatched lifetime of accomplishment in reining, it is entirely appropriate that the NRHA Lifetime Achievement Award is named for Dale Wilkinson. Shatner will be recognized with this year’s class of NRHA Hall of Fame inductees at Sliders’ Night Out on Nov. 28 at State Fair Park in Oklahoma City during the NRHA Futurity.